Lectors & Altar Servers Needed! Boys and girls, 3rd thru 10th graders, would you like to serve on the Altar? The parish is in need of altar servers for the 4:00pm Saturday Vigil Mass. 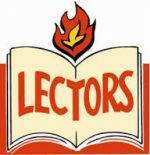 If you would be interested in being a Lector or Altar Server please contact the Rectory at 683-2375.